The eagerly awaited 8th Annual UK Diversity Legal Awards took place on Tuesday 28 November at the prestigious Grange St Paul’s Hotel. These are the only industry awards which focus solely on recognising and promoting equality, diversity and inclusion across the legal profession. This year we were proud to showcase an incredible line-up of finalists representing a broad spectrum of diversity, including gender, ethnicity, sexual orientation, mental health/wellbeing and social mobility. 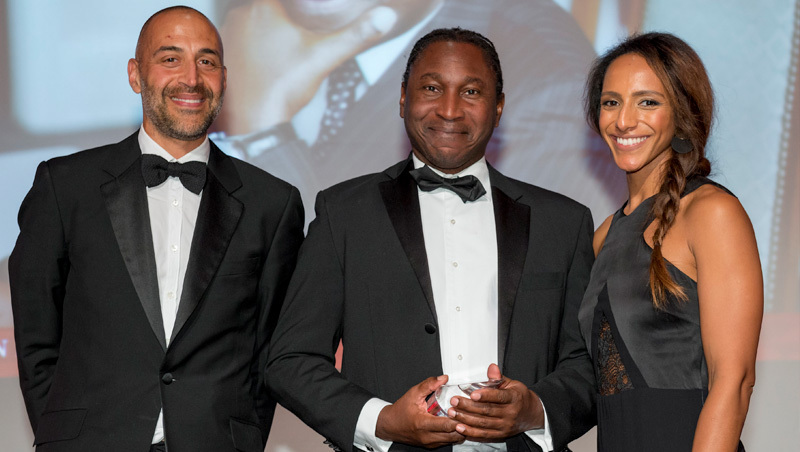 The sold-out Awards were attended by over 250 guests from within and beyond the legal profession and presented by award-winning author, broadcaster and journalist, Afua Hirsch. Highlights from the night included addresses by Paul Philip, Chief Executive of the Solicitors Regulation Authority (the Awards’ headline sponsor), Christina Blacklaws, Vice President of The Law Society, Andrew Langdon QC, Chair of the Bar and Matthew Ryder QC, Deputy Mayor for Social Integration, Social Mobility and Community Engagement. Matthew presented the BSN Lifetime Achievement Award to Dr Leslie Thomas QC (Chair & Joint Head of Garden Court Chambers) and remarked that his admiration and respect for Leslie’s exceptional success at winning cases (and securing record-breaking damages) against the state was only matched by his humility and selfless commitment to serving his community. Dr Leslie Thomas’ outstanding achievements are an inspiration to us all. Lending his support for these significant Awards, Sadiq Khan, Mayor of London, said he has “a leadership role to play in shaping and responding to changes in this great city. Our population is becoming more diverse. It is therefore a real pleasure to support the UK Diversity Legal Awards 2017”. Thanks to our sponsors this year for their support in making this celebration of diversity in all its forms possible: Solicitors Regulation Authority, Linklaters, LexisNexis and Thomson Reuters. We hope you will nominate your diversity champions, role models and initiatives for the UK Diversity Legal Awards 2018, nominations for which will open in the Spring! Details will follow in the New Year. Until then, best wishes for the upcoming season.